Here it is, October 1st. 2017 is almost done. Another year I did not get as much baking done as planned. I’ve learned to roll with the punches though and except that sometimes life has us going in different directions. Nothing has changed with my passion and as I always hope, things will hopefully go my way the rest of this year. I have many more recipes I want to share before the year is through. 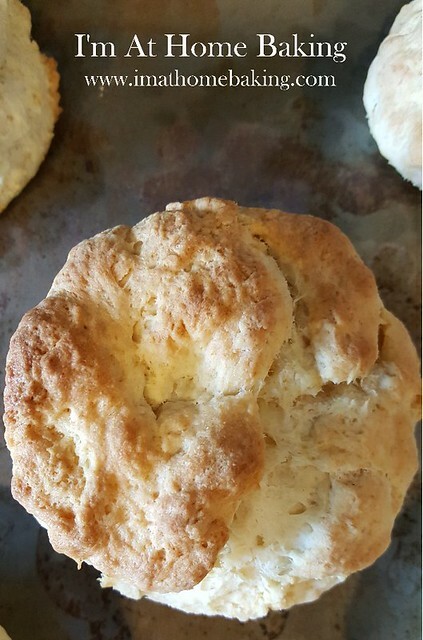 Nothing is more cozy on an October morning than a cup of coffee or tea, and homemade Southern Biscuits and Gravy! It is just perfect any time of day though! If you’re family is anything like mine, we often eat breakfast for dinner too! 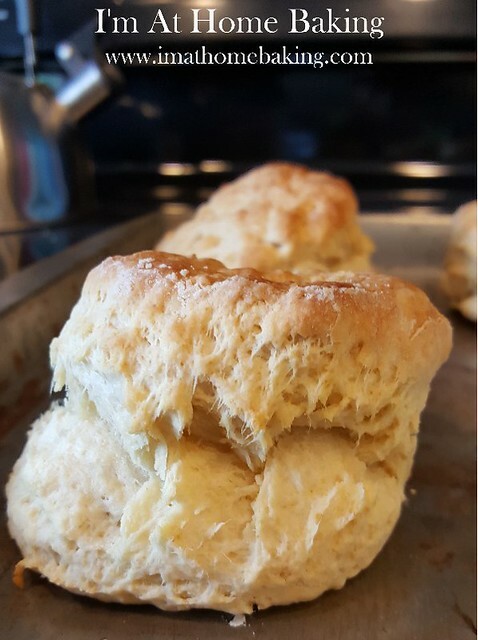 While it is not often, I will from time to time add an optional non-baking recipe too, such as today. 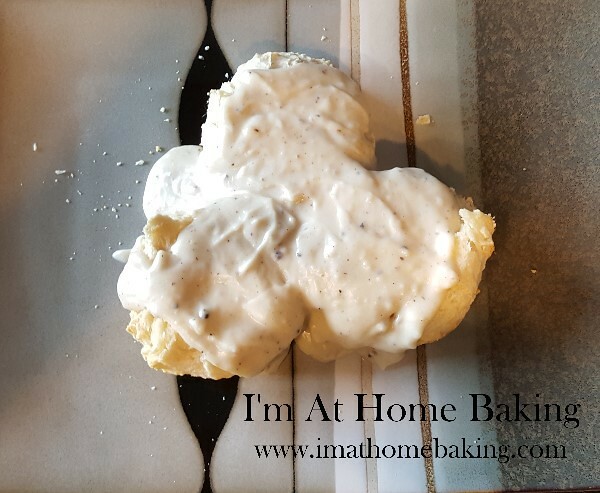 The gravy recipe is my husbands and you will love it! 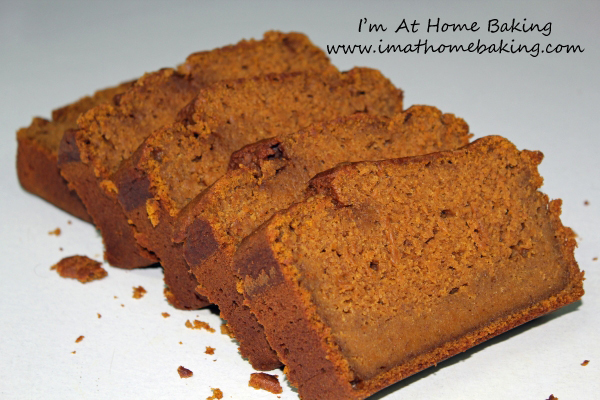 It is thick and delicious and could be used in many other recipes. Please try it and let me know what you think of it. I must be honest, and I’ve probably stated this before… but I am not a huge fan of buttermilk. I know… but sometimes it can be funky. 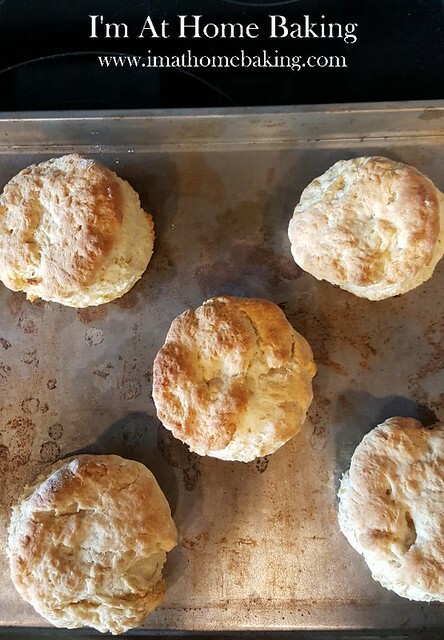 Let me tell you, these biscuits are the best. Not because it is Alton Brown’s recipe. It is well known that I just adore all things, especially his recipes. Flavor, and pillowy, flakiness, perfect I’d dare even say. You must make them. Using your fingertips, rub the butter and shortening into the dry goods until the mixture resembles coarse crumbs. Or you can also use a pastry cutter. Heat butter in medium sauce pan on medium. When melted add flour, salt, and pepper. Stir till flour and butter is mixed. Should resemble a sand like mixture. Stir in the milk then return sauce pan to medium high heat and stir constantly.to prevent milk from scorching. Continue to stir till mixture is thick and bubbly. Remove from heat. Stir another 1 minute as it thickens. Remove from heat, stir an additional 1 minute for further thickening. Add additional salt and pepper to taste. I am sorry. Military life really throws things at you sometimes and well, that recently happened and there are some changes coming, some have happened and few are about to. BUT, I will bake on! Everyone enjoying fall? Or do you live in another country or possibly live somewhere like I do, Hawaii..where it’s hot all year round? It has been very toasty here. I keep reading all my friends & family statuses on Facebook, talking about cool and crisp weather, changing leaves…and I’m all like: “I’m melting”. Do you have any fresh blueberries or maybe have you frozen them and wondering what to do with them? Blueberry muffins of course. Now I have made a few blueberry muffins in my time and I have posted one since starting this blog. You should check it out as well HERE. Let’s talk Alton Brown for just a second. I used to watch Good Eats and fell in love with his culinary genius. I own several of his books and well of course I watch his shows on Food Network and am always dabbling in his recipes. These muffins smell amazing, they are delicious and all around yummy. I did find that I had to adjust the oven temperature after the first 10 minutes of baking though. 400 degrees will burn these quite quickly, at least in my oven anyways. I ended up turning it down to 350 after those first 10 minutes and they came out perfectly. Watch muffins after 10 minute mark. If they look to be baking to quickly on the tops, turn oven down to 350 F.
In another large bowl, whisk together the sugar, oil, egg, vanilla and yogurt. Add the dry ingredients reserving 1 tablespoon of the dry ingredients and toss with the blueberries. Stir mixture for a count of 10. Add 1 cup blueberries to mixture and stir 3 more times. Reserve the ½ cup of blueberries. Using a #20 ice cream scoop, add the mixture to greased muffin pans. 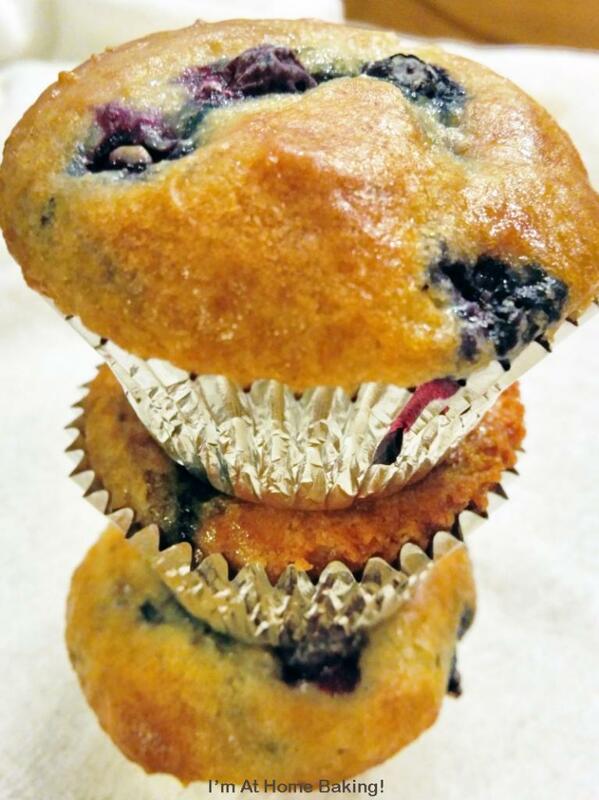 Sprinkle the remaining ½ cup of berries on top of muffins and press down lightly. Place into the oven and increase the temperature to 400 degrees. Bake for 20 to 25 minutes, rotating pan halfway through. Remove from oven and turn out, upside down on tea towel to cool completely. Serve immediately or store in airtight container for 2 to 3 days.